See the Whitsundays from above with a stunning scenic flight over the islands and Great Barrier Reef, including famous Heart Reef and Whitehaven Beach, then ride the tropical waters with Ocean Rafting! Each Ocean Rafting adventure offers three days in one, choose between the Southern Lights or Northern Exposure tour for a fun-filled day out around the islands. Join the Southern Lights tour if you are looking for more time on Whitehaven Beach, or choose to do the Northern Exposure Tour if you would like your tour to have more of a focus on snorkelling. Regardless, both tours will still deliver you the opportunity to snorkel, take the Hill Inlet Bushwalk and explore Whitehaven Beach. 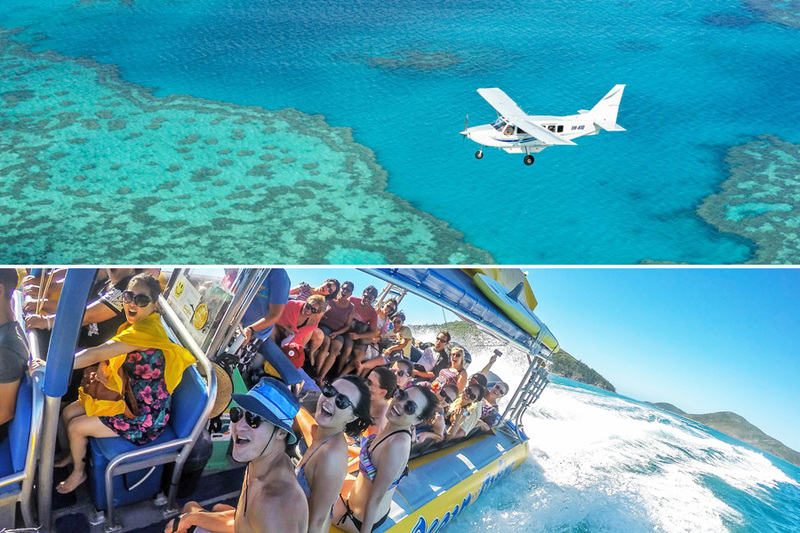 See the Whitsundays from above with a stunning Whitsunday scenic flight over the islands and Great Barrier Reef, including famous Heart Reef and Whitehaven Beach, then ride the tropical waters on Ocean Rafting's Southern Lights or Northern Exposure tour. 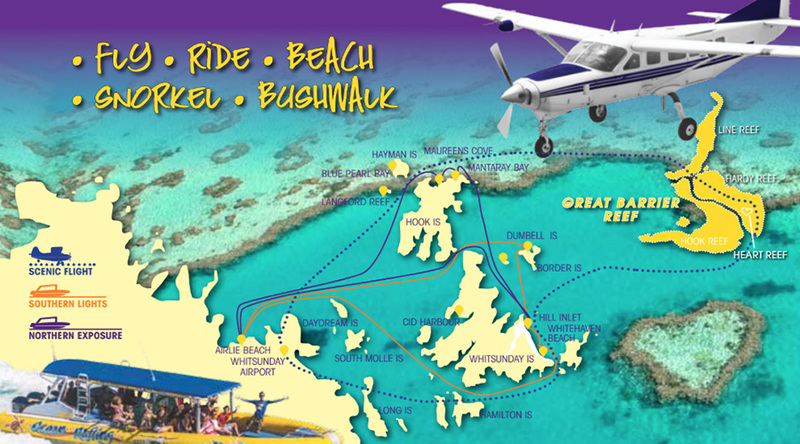 Enjoy a bird's eye view of many of the 74 Whitsunday Islands, fly over Whitehaven Beach and picture postcard Hill Inlet before heading out to the Great Barrier Reef and experiencing one of the most photographed reef locations, Heart Reef. The comfortable fixed wing aircraft offers big window viewing, pilot commentary and the best views of the Whitsundays! Ocean Rafting returns: 3.30pm (Northern) or 4.30pm (Southern). *Timings will be confirmed upon booking. Please note this is a sample itinerary and may be subject to change. All fares are inclusive of Marine Park fees, National Park fees & GST. Sites are weather & tide permitting. Ocean Rafting reserves the right to charge our customers a fuel levy if fuel is over $1.50 per litre & the right to arrange alternative itinerary when necessary. Liability: Clients should note that adventure travel involves risk. Whilst we make every effort to safeguard our clients, we cannot be held responsible for personal injury or loss due to the actions of the clients which are beyond our control. A signed release will be required from all participants on departure. We recommend you take out travel insurance. Fitness & Heath: Although good health and a positive attitude are essential, you do not need any prior experience to partake in any of the activities and tours in this brochure. Minimum numbers of four passengers for flights/flight packages apply. Flights are subject to pilot discretion, weather and air traffic control. Ocean Rafting may use photographs of our clients in promotional material, including but not limited to social media, however if you do not consent please advise Ocean Rafting. For legal and safety reasons all passengers are weighed prior to boarding. Individual weights in excess of 110kg will incur an extra seat surcharge. Combined body weights per two passenger bookings in excess of 180 kgs will incur an extra seat surcharge. Maximum per seat weight is 130 kgs.